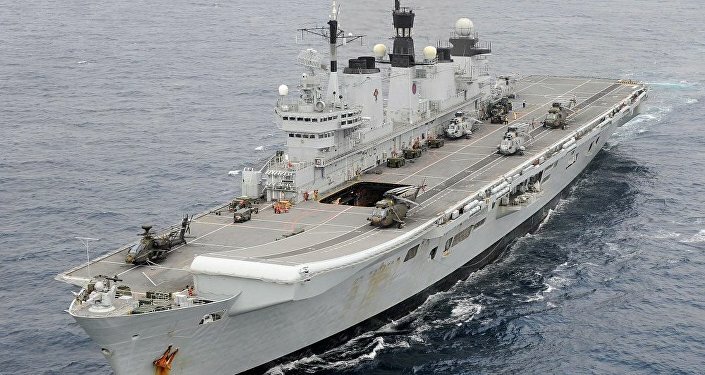 Commenting on the recent decision of the British Royal Navy to send one of its warships to the Black Sea with the announced purpose to "lead a NATO task force and help protect 650 British troops who are involved in secret exercises in Ukraine," Russian defense analyst Boris Rozhin explains to Sputnik the real reason behind the move. Britain has announced its decision to dispatch one of its most advanced warships, HMS Diamond, a Type 45 destroyer, to the Black Sea, on the first operational mission to the region since the Cold War. "HMS Diamond, a Type 45 destroyer, will sail to Ukraine carrying as many as 60 Royal Marine and Special Boat Service commandos – and equipped with state-of-the-art anti-aircraft rockets," The Sun reported on Sunday. Earlier on Saturday, the Daily Mail said that the move was "part of the biggest British military build-up on Russia’s borders for decades, and comes after the Prime Minister [Theresa May] told US politicians that Britain and America should stand up to President Vladimir Putin." It further revealed that HMS Diamond will lead a NATO task force and "help protect 650 British troops who are involved in secret exercises in Ukraine." Meanwhile, UK Defense Secretary Michael Fallon said that in this way the UK "is sending a clear message that it is committed to defending democracy across the world and support Ukraine’s sovereignty, independence and territorial integrity." Commenting on the move, Russian military expert, the editor in chief of the Cassad information-analytical center Boris Rozhin, who also runs the popular blog Colonel Cassad, told Radio Sputnik that some European countries fail to admit the emerging new reality. "First of all, it is an attempt of the UK to demonstrate its subjectivity in international affairs," he told Sputnik. He further explained that during the Ukrainian crisis, Britain was subservient to Washington's policy, which is currently undergoing changes. However it, together with Germany, refuses to admit the emerging new reality. Hence the two countries are undertaking military steps and anti-Russian sanctions which are aimed at impeding the possible U-turn which is expected by Washington after the US's political revolution. "Hence these are all attempts against the renormalization of relationships with Russia," the military analyst stated. If Admiral Kuznetsov is So Insignificant, Why Did the UK Go Ballistic About it? Boris Rozhin also commented on the recent hysteria in the UK caused by the Russian Northern Fleet carrier group led by the Admiral Kuznetsov aircraft carrier, which was returning from its mission to Syria to its base in northern Russia via the English Channel. He also recalled the disrespectful remark of UK Defense Secretary Michael Fallon about Admiral Kuznetsov aircraft carrier, who called it a "ship of shame." "They have made a story out of it, called Admiral Kuznetsov a "ship of shame" because we support the government of President Assad," he told Sputnik. "I mean that was an absolutely poor reaction. However it can be also explained by the fact that back in December Britain's last aircraft carrier ‘HMS Illustrious’, known as Lusty, was set sail to be scrapped in Turkey, leaving a self-conscious "Former Queen of Seas" without a working replacement and rocked by equipment scandals," he added. The military analyst further said that the dispatch of the destroyer to the Black Sea is more of a declarative move, a complex reaction to a number of irritators which Britain is unable to answer adequately. Hence they can only resort to declarative moves, so-called flag waving, he concluded.